I’m sure you’ve been hearing a lot about Pinterest eh? It’s a powerful visual search engine that can help grow your traffic and email list. Well, when I started this new blog, I knew one of the quickest ways to bring traffic to my blog was to start pinning. But, I had no idea that I would get so many followers too. Every month since starting to grow this blog I’ve been steadily gaining on average 500-800 new subscribers each month. And what’s even more cray-cray is that I really didn’t do anything to get those followers. I don’t mean I didn’t do ANYTHING, but what I did didn’t take much effort. I’m a busy mompreneur here. I don’t have time to grow my social media followers. Heck, I don’t have time to cut my hair! Ouch! That hurt saying that. If I can find a way to supercharge my productivity and use my time better, I’ll do it. And I know there are other mamas and bloggers out there that just don’t have the time to spend hours trying to grow their Pinterest followers. In my short time using a Pinterest strategy, I’ve analyzed six things that I know have helped me generate followers. But, before I get into that, let me show you how I got form point A to point B. Earlier this year I decided to grow this new blog. It’s a new niche and a new blog and I’m even blogging about my growth too. When I started I only had around 600 followers. 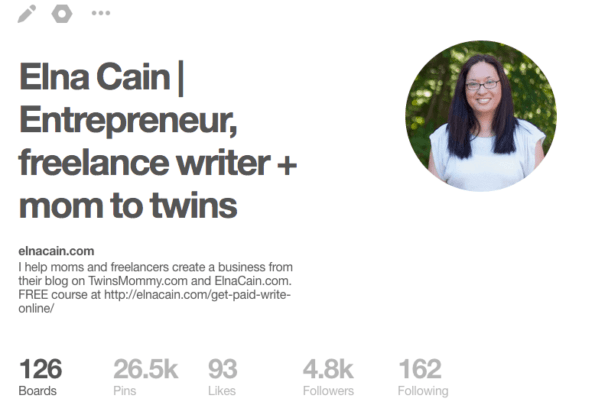 My Pinterest profile was for my other blog about freelance writing. I decided that instead of signing up to a new Pinterest account, I’ll just share my current one. My profile wasn’t used much since I started freelance writing. I had a couple of boards about freelance writing and the rest were hobby type boards. So it was like a fresh start. Within two months of actively being on Pinterest, I had over 1k followers. And by my third month, I almost gained another 1k followers. I wasn’t following many people. In fact, I stopped following people – unless they were my blogger friend – and I still gained more followers. Now, six months later, I had 4.8k followers. I did all of this and didn’t spend much time doing it. If you’re struggling to gain Pinterest followers or playing the, “if you follow me, I’ll follow you” game and unfollow those that don’t follow you, here are the six things I did to help me grow my followers. In light of all the new Pinterest updates that’s been going around, are group boards still worth it? Yes and no. For brand new bloggers group boards are the way to go. What’s great about them is that your pins can reach thousands or millions more pinners than they could if they were on your own boards. And this helps establish your profile if you’re a new pinner. I belong to over 60 group boards and when I first started promoting my new blog, I used them frequently. From mom groups to growing your blog groups to social media groups and to freelance groups, if it’s related to being a mom blogger I’m in it. If you don’t belong to many group boards, pick up my absolutely free promo list of over 60+ FB and Pinterest groups. But please understand, these are my personal results. Tailwind also publishes the Typical Results of Tailwind for Pinterest Members every year, so you can see exactly what the average growth rate looks like for their members. Tailwind is a Pinterest automation schedule – say that 3x fast. It lets you schedule any pin you want – from a blog post, on Pinterest or within Tailwind – to any Pinterest board you have. It even lets you know the optimal time to schedule your pins and you know what that means? All the hard stuff is taken care of. With Tailwind, each time your pin is sent out, it’s when your audience is on Pinterest. One thing I like about Tailwind is their board lists. Like I mentioned, I have over 60 boards and before I knew about board lists, whenever I scheduled my pins, I had to manually put each board in for the queue. Can I say time waster? Well, the board list is a template. So you make a list of all the relevant boards you want your pins to go to. 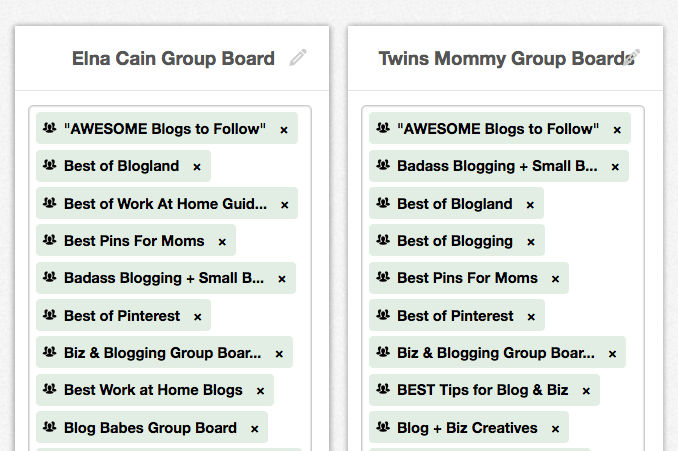 Since I have two blogs, I have my Elna Cain blog list for freelancers and working from home and I have my Twins Mommy list for blogging, making money, and moms (some boards overlap). I could also make a list for social media posts or just for twins or for blogging tips. It’s up to you how you categorize your lists. Once you make a template, when it’s time to schedule your pins – I schedule mine on Pinterest – I just have to click one time to schedule hundreds of times. If that’s not amazing, I don’t know what is mamas! If you’re interested in using Tailwind, you can schedule up to 100 pins absolutely free! There’s no time limit either! Just click on the image below to get started! Check out my YouTube video on how I use Tailwind to schedule my pins! I’ve been hearing from other bloggers that they’re active on Pinterest or they are scheduling their pins but they have a small conversion rate, i.e. no one is clicking through. Now, why should you be concerned about click-through rates when all you want is more Pinterest followers? Because no one’s going to follow you if you have poor content. While it’s also a great idea to have a visually appealing blog design, that’s not going to help you grow your social media followers. And one of the first things a pinner is going to read is your headline. You have about two seconds for them to decide if that pin is worthy of their time. I found that one of the best headlines to use on Pinterest are personal ones. Using “I” or “my” seem to generate more repins and click-throughs for me. Your headline should also show a benefit for reading your post. Will your pin help them blog better? Earn more money? Save them time? Have the best chocolate chip cookies ever? If you can show a benefit for the reader in your headline, they are more likely to click through to your post. And if you have an engaging introduction that hooks them, they’ll remember your content and not only subscribe to your list, but also follow you on Pinterest. A lot of my subscribers found me via Pinterest! I L-O-V-E looking at images. Don’t we all? They’re so pretty and I’m always wanting to know what font you all are using!! I love fonts, stock photos, and colors and Pinterest is a goldmine for awesome images. I’m not the BEST at images, but I try. I use 600x900px for most of my pins and alternate pins. There’s a lot of talk on social media about what size your pin image should be. While many have different sizes, they all agree that your pin image must be longer than it is wide. A taller version I use is 600x1260px. Your font must be large enough to read. I use two fonts on my images. A sans-serif font called Futura, which is included on Mac computers, but you can grab this paid font and others with a subscription to Typekit (for Windows too). I also use Madina that I got at Creative Market. If you’re bootstrapping it all, you can definitely use Google fonts – they’re totally free. It goes without saying that a picture is worth a thousand words…and repins! There are a ton of places to grab free images that are beautiful! While most pinners view your pins on mobile and rarely go to your profile to look at your boards, you can brand them with a cohesive look. I feel that branding my profile helped me grow my followers quickly. It showed some of my overall brand scheme and made me stand out from other pinners. You may not agree with me, but ever since I started branding my images and my Pinterest board covers, I noticed more people following me. I used Photoshop to create my board covers, but you can use Canva too! One of the first things I did with my profile was make sure my bio had keywords in my niche and told people what I do and where to find me.. When pinners go to my profile they know exactly who I am – I help moms and writers create a business and where to find me. You can also state who you are – freelance writer, blogger, Pinterest manager etc. in your bio. Make your bio value driven so that people have a reason to follow you. As you can see, I didn’t try to grow my followers on Pinterest. Tailwind helped me schedule my pins out to more people, which helped me gain more followers. And what about now? After two years of using Pinterest and Tailwind? I have over 21k followers and it grows every day. The only effort for me is writing my blog posts and creating my images. Don’t forget to grab my FREE Pin Promote Planner! You get a weekly planner, monthly planner and yearly planner! This is what helped me triple my traffic, list and followers in only three months of starting Twins Mommy! What great technical ideas! Pinterest still confuses me, but you have definitely made it easier to understand. Thank you so much for the tips! That’s great to hear. Yes trying to find ways to grow your followers on Pinterest can be a challenge. I hope these tactics work for you! Thanks for sharing your experience! Sounds easy, but i now it’s not so simple to get even least 10 followers! Great advice Elna! i’m trying to grow my Pinterest following now and these tips, especially having a better title! Elna, this is such an incredible post. I’ve found it so, so helpful as a new blogger starting out and trying to gain traffic. Your tips are detailed and thoughtful. I’ll definitely be reading more! PS: You have twins and are doing all this. You’re like superwoman! You’re welcome! So glad you want to start Pinterest marketing for your blog. It really is a great way to gain blog traffic. Try using these tips to grow your authority and followers on Pinterest! Thanks so much for following me! Feel free to read the posts on this blog and sign up to my list. I do provide great tips for new bloggers! This was a great read with useful tips. II had to create a new Pinterest board for great blogs just because of this blog. Great info and thank you for being so down-to-earth about your growth strategies. But oh geeze, how’d you take the plunge with a consistent pin theme? I scroll through those Canva templates and just can’t decide on one! It’s been weeks. Ha! Yeah creating pins is fun for me! I just think of some new things and play around with it on my pins! I was already an ardent follower of your freelancing blog and now you have got me hooked onto this one too. Great work as usual and some really awesome tips for new bloggers like me. thanks a ton. Hello Elna! Thank you so much for this post! I apologize if this has already been asked! My personal Pinterest account has been active for years and covers a multitude of things that I have liked over the years. Do you suggest I continue to use that account or should I create a separate account to be based around my blog? I would use the personal account and switch to a business account. Having an aged Pinterest profile has some Pin juice to it so use it! Hi Elna, this was great info. I’m just starting out using Pinterest for a new blog. I’ve taken a few Pinterest courses that cover the Pinterest side of things, but one thing that I’m a bit confused about is the best placement of the Pinterest image inside my blog post. Some blogs have a featured image at the top with a Pinterest image at the bottom, some just have a huge Pinterest image at the top…so I’m uncertain what is the best thing to do! Thanks so much! As for your Pin image, it’s really personal preference. If you want to tailor your blog for pinners, having your pin graphic as the feature image would work! For one blog I place the pin image in the middle of the blog post and for another I have one on top and one at the bottom! So, it really is personal preference! Elna I see the benefit of Pinterest big time; just following a few boards popping up in my main stream connects me to rocking bloggers. I also see passive traffic flowing to your blog – and more followers – as top Pin worthy boards get top billing. Well done. Thanks so much! So glad you found tips for your Pinterest followers and Pinterest marketing strategy. As for those types of group boards, I wouldn’t worry too much. As a group owner of three group boards, I don’t police them too much so I would suspect many of bloggers do the same! Just make sure to hit shuffle if you schedule your pins that way with Tailwind! I just came across your blog, and I can’t wait to try this method! I will totally give you an update on how it goes. Thank you for this advice! So awesome! I can’t wait to hear your success on Pinterest marketing and gaining more Pinterest followers! Elna, I followed your advice and my blog went from 12 daily viewers to 281 in one day!!! 99% of my traffic came from Pinterest. I’m so excited. I followed these steps and yes it is just that simple. I’m excited about the next step. Congrats mama! Pinterest is every changing but just be consistent and publish fresh content using TW and you will grow your follower count and impressions! I just passed 20k followers on Pinterest! Hey Elna! This is a great article! I’m very new to blogging and the post s very encouraging! Thank you! You’re welcome! So glad you found tips to grow your Pinterest followers! Hi Elna, this is Leah from a Natural Endeavor.com! This post is very well done, and has some helpful advice that I applied to my own Pinterest site. Thank you! That’s great to hear you are focussing your promotional efforts on Pinterest! It really is the best place to build your traffic! Hi Elna, thanks for providing such great information on your website. I have signed up for your Pinterest group list. Just started my Pinterest account http://www.pinterest.com/givinggiftsguide/ about a month ago and I am now at over 20,000 Monthly Views. Looking good! As for monthly views it’s how many people see your pins on Pinterest! Love your post. I have been blogging for almost 2 years now and I am getting discourage because my traffic is an average of 30 views per day. I tried everything I can think of but it is not working. I am just starting to focus on pinterest. Hopefully it will get better. By the way, I would like to subscribe to your email list and get the Pin Promoter Planner but I have no idea on how to do it. I can’t seem to find the link. Hopefully you will be able to add me to your list. I just decided that I would need to focus on one social media for a while and I have chosen Pinterest becuase I heard so many things about getting many viewers thru this platform. Thanks for enrolling! Check spam folder if you can’t find the email with the link to the Pin Promote Planner! One thing to consider is to have a self-hosted blog. Google seems to be good to self hosted blogs as well as social media! There are so many Pinterest strategies and it all comes down to what works for you! Good luck using TW! Great info. Since I never used Pinterest before, as a newbie blogger it looks like a foreign language to me. However, your blog posts has been helping me, I’m sure I’ll get better. Thank you for sharing! That’s great to hear! Pinterest is really great for bloggers in general! Just bought your Ready Set Blog course and I am loving it! You mentioned in this post that your pin sizes are 600 x 900px with a tall pin at 600 x 1260px. You mention some other sizes in the course. Which is the most current sizes? Yeah, back in the day my pin sizes were larger but since Pinterest changed the sizes, my new size is 600×900 and 600×1260. I will be updating the traffic course this summer and fall! Lately I am stumbling on a lot of courses that talk about Pinterest as a great way to get free traffic, and I your article has filled in a lot of blanks on how to do it well and successfully. Thanks so much! Glad you found some tips to help you grow your Pinterest followers and traffic! Good luck! Great tips Elna, I was expecting something totally different. Thanks for sharing. You’re welcome! Glad to surprise you about Pinterest followers! This information is awesome! I so appreciate you sharing all of this with us! I am still trying to build up my social media and I need to remember to keep joining group boards! Thanks so much! Yes, growing your social media followers on Pinterest can be a challenge. For my other profiles it’s taking time to get to my first 1k followers! But, just keep being consistent! Awesome tips! I’ve used Pinterest personally forever, but am just “learning the ropes” when it comes to growing my business account. I can’t wait to start implementing these ideas, especially Tailwind. Thank you!! Yes, Pinterest is a great tool to market your new blog! Glad you enjoyed this post! Good luck with growing your blog traffic with Pinterest! Hi Elna! These Pinterest tips are awesome. 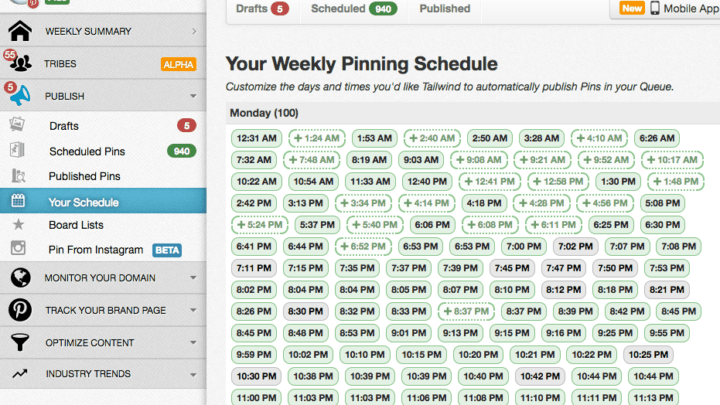 I’m also using Tailwind and I can say that it’s a pretty cool Pinterest pins scheduler, such a great help for me too. Thanks so much!!! Congrats on your blog and yay! Kick Pinterest for you!!! I was using Boardbooster but have recently tried Tailwind and I prefer it. Both are great but Tailwind I find easier to use. I have to admit that I always went for Google search results but I am fast seeing that Pinterest is a much better strategy for building traffic. I’m still trying to figure out Pinterest and this is super helpful! Thanks! You’re welcome! Glad this helped! Hi Elna, Great information. I am planning to start a blog …and for that grabbing the information as much as I can . This post is very useful and encouraging for new bloggers like me. Thank you! That’s great to know! Good luck on starting your blog and getting on Pinterest! You can do it. Just be consistent on Pinterest and Tailwind really has helped me. I put my new blog Smart Mom Ideas, on the Tailwind automation and my followers grow daily! You’re welcome! So happy you found some tips to help you increase your Pinterest followers! Amazing post! I follow your advice and try to increase more traffic! Hope it will work for me! Thanks. This question might seem confusing but I’m confused about repinning your own pins. Do you mean that you repin your original post pin or do you create new pins and post those over and over again? When you publish your post, you pin that post to Pinterest. Usually people pin that first pin from their blog to their own board. Then you go to THAT board and pin THAT pin. You don’t make a new pin or go back to your blog and pin it again. You want to establish repins, or shares, on that ONE pin. So repin that ONE pin over and over again and others will repin that pin for you! So glad you have tips to help you grow your Pinterest followers! It is a challenge but it takes time for sure! Good luck! These were so helpful. This will help me alot! Thanks so much for this! Thank you so much! 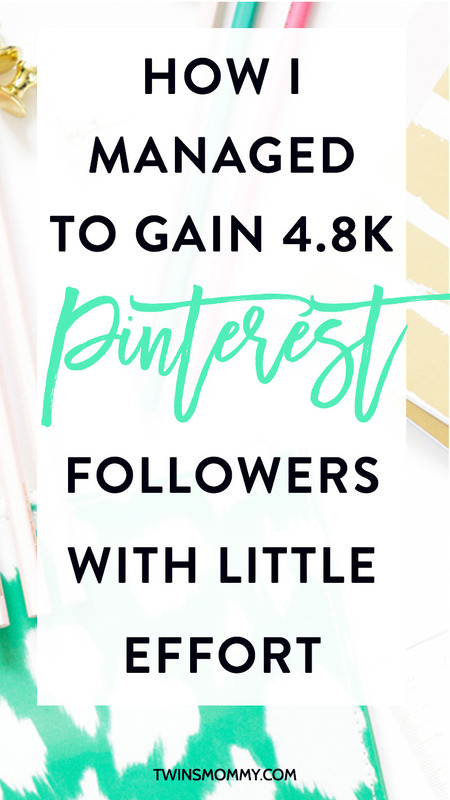 Growing your Pinterest Followers can be a challenge now, but this plan in the post is what I still do! And I have almost 15k followers now! You can do it! I wouldn’t worry too much about not getting a response. I sometimes don’t respond to my emails; I just let people in the group. Make sure to check your Pinterest notifications! I would also try lower tiered group boards with a lower reach to get in. These group owners are more than happy to let you in because they are trying to grow your followers. Also, make sure you have appealing pins too! Wow Elna, thanks for sharing! 60 Group Boards is a whole lot of boards. I use board list in Tailwind as well but how on earth do you schedule to those group boards? Is it 1 pin per group board per day using the pin interval? With Tailwind, I schedule my pins on Pinterest and put them in the board lists and Tailwind does the rest. I have more group boards than the pins I share so I’m not duping any pins. So my next obvious question. What is the secret to getting into 60 group boards? I am already in 15. I probably sent requests already to 30 group board owners. What is the conversion ratio for the acceptance rate? 100 requests to join 25 accepted? I’m a newer blogger and feel stuck with Pinterest, but this has finally given me the courage to start Tailwind and get on some group boards. That’s awesome! Happy to hear you’re going to do Pinterest! Yay! Have fun! I simply love all of your content! Coming across this has been a huge help, thank you so much 🙂 Do you have any Pinterest boards I could join? Check out my Pinterest profile for group boards you want to join! Thanks for the advice! I’m new to Pinterest. I don’t have any followers yet and just started my boards but will definitely try your strategies. Glad you found some tips to get you started on Pinterest marketing strategies! does this mean repining my own pin for 5 times in my own boards and how would this help, is it to get the persons attention so they would follow me? Also do you have suggestions as to how to find great niche groups? (am more on the diy/craft/design) and is there much point in joining groups not in your niche but more popular?. Thank you! Thanks for downloading the Pin Promote Planner! With the notification pining. The idea is that the person who pinned your content will get notified that you pinned from their boards. This can be a way to grow your followers. It’s not 100% but it’s something! Wow..This is just the Pinterest strategy that I’m looking for! I’m at a similar amount of followers to where you started so I’m definitely going to implement the different strategies that you recommend and hopefully start using Pinterest to drive more traffic to my blog. I’ve already optimize my bio and I started creating some really good looking images so I’m going to head over and pick up Tailwind right now and start applying for group boards. Thanks so much for this, Elna. It really is amazing information for us bloggers looking to take advantage of Pinterest! Thanks so much! Good luck with finding group boards! Remember to list the group board you want to join in your email and give your Pinterest URL so they can view your profile! This was super helpful, I went back to my profile and tweaked it after reading your tips! Thanks for sharing! I am pinning this post on my pinerest ! That’s great! I hope you start gaining more Pinterest followers! Thanks for sharing your success. The only two things that I am not doing fully are group boards and board covers. However, I heard that board covers are not necessary for the updated Pinterest November 2017? Is that the case? Board covers are still a good idea but not necessary. They just make your brand known a little better and since they have the carousel feature before your boards, having a niche branded picture there looks professional! I am a new blogger and your article has SO much great information! I started my Pinterest page about 2 weeks ago and have over 4,000 views on it but no followers! Do you have any advice for not just getting views but also getting people to follow you? Thank you! Try using Facebook! You can drop your profile link to get followers on promo days or social media days! I found your boards when I was so discouraged. I lost my job recently and I am trying very hard to have some income to help my family with my blog, which is basically new. I created my Blog in July but, had to take a break from working on it as I am pregnant and you probably know how suffering and difficult the first trimester can be. Now that I have completed this period I am back to work but, sometimes I feel that I am not getting anywhere and feel like an idiot dreaming with something that it will never come to be true. I don’t have any money to invest on professional help, SEO, etc. But, after reading your post I went to sleep with a little bit more of hope in my heart and I am ready to try harder and see what life will bring to me. Thanks for that! Can I give you a hug! From helping others bloggers, I know you can do it! Congrats on your new pregnancy! I suggest you ignore all the others preaching and focus on your strategy! I’m taking a Pinterest course, and this article was a great supplement to what I’m learning now. The stock photo links you provided were super helpful! I also use CreateHer Stock Photos for stock photos featuring women of color. Thanks for the helpful tips, as always! Awesome! There are lots of great Pinterest courses out there. Which course are you taking? There really are. I’m taking the Pinterest Traffic Avalanche course. Create and Go is an awesome site! Are you pinning 100 times a day… every day :O ? No I don’t I only pinned that amount in the beginning of growing my blog. I wrote that post a while ago when I started Twins Mommy. I now only pin around 30 times a day. My Pinterest followers are over 12k so I don’t need to post in group boards that often! Thank you for this information. I found this while at work so I will begin to implement these things once I get home. Also, I am just getting started blogging on my Senior website/blog to bring in more traffic…do you have any suggestions to gaining my target clients to read my blog? My website is http://www.missaraebia.com and I welcome any suggestions. I am also a mom blogger. I have 6 children, (1) just got married last week. Thank you so much and I am super excited to have bumped into your blog! I took a look at your blog! Amazing! Love it. Your blog, though, is localized, which means it’s harder to get blog traffic. If you want to extend your brand, I highly suggest you sell stock images for bloggers. You can grow your email list by providing free stock photos. Is the “board list template” you refer to in this article actually a tailwind tribe? I can’t seem to find where to create this list of group boards in Pinterest or tailwind. I have several group boards I am in and would like to save some time. Thanks! Why haven’t you placed adsense ads on your site? Are you just earning on sales? I just want to say that I LOVE your content and your course. I just signed up for it through all of the courses I’ve completed, I have to admit I’m finding yours to be one of the most impressive. Taking your advice about blogging more often! Thanks so much <3 Enjoy the course (which one might I ask?) and have fun growing your Pinterest following! Your blog is just what I needed today. Looking to get my new adventure off the ground, and your site is perfect. Thanks so much for taking the time to curate all these resources! Aww, hugs and kisses! Thank you so much! You made my day. So glad you found some tips to help you grow your Pinterest followers! Thank you so much for sharing. I started my blog a few months ago and it has been a slow process for me to setup and grow my blog. I haven’t had the traffic needed so I read your article to see if you had any tips. You have definitely added insight so I will try to implement tailwind to more followers. I am so excited and ready to see my blog grow and my followers increase. Thanks so much! Yes, Pinterest is a great driver for traffic and when bundled with Tailwind, they make the perfect pair! I started to try and focus more on Pinterest and Facebook rather than Instagram. I feel I am on the right path. I optimized my board covers and I’ve been typing in detailed descriptions on each post. I guess next thing to do is really get pinning. Thanks for the advice. That’s great to know. Pinterest is really a powerful platform to drive traffic and sales. Enjoy the visual search engine! Fantastic tips, thanks for the post! I’ve been doing my best to grow my Pinterest following as well – just got my first 100 followers – actually took me quite a lot of work, so I hope, that using your tips, I will be able to get more followers faster! Great post and keep up amazing work! That’s great. For newer accounts it will take you longer. Aged Pinterest accounts can grow a bit faster! Good luck! A great post! This is Misato from https://fitwirr.com/. When I initially started, I grew my followers the very similar ways as yours – group boards, long images, Tailwind, etc.. One thing I really appreciated Tailwind was they give you stats on each boards’ ROI. The boards with most followers, activities, etc.. were all there, and it helped me narrow my focus and really understand what people are interested in and wanted to see more of. Anyhow, I just wanted to say I’m happy I came across your blog, and it was a great read! Good to know. Yes, I love group boards to help me boost my traffic for sure! Hi there, I want to start using Tailwind and have already used the free 100 pins, but with the amount that people say to pin, it’s very expensive. People are telling me to pin hundreds of times a day and Tailwind charges per 50! How much should I be expecting to spend on Pinterest automation? Tailwind is budget friendly when you pay annually. You can have unlimited pins for only $9.99 a month (when you pay annually, which I recommend doing to save the most). Thank you for sharing! This was very informative. How do you join groups since Pinterest just recently changed the format? Just go to a group board and read the instructions on how to invite yourself! Great post! I find it very insightful. Building my followers on my personal blog and on Pinterest have been very tasking for me though I feel I’ve not been giving much attention to it as I should. Thank you for this post. I will like to get directions to more insights. So wait, you had 600 followers to start with? That was already a ridiculously advantageous position. Most of us have to grow our boards with 0 followers. When people see someone with 0 followers, they are unlikely to follow that person. Those 600 followers were from my personal account and was over 2 years old. So basically, I had to start from scratch. I removed a lot of those followers as I was growing my Pinterest account since I wanted targeted followers. How do you remove followers? Thank you for some great information. I have been blogging for a short while now and am trying to maximize my Pinterest account to it’s full potential. Right now I’m working on branding my blog/profile to make it stand out a little bit more and get my Pinterest boards organized. Thanks again for some great tips! Thank You, Thank You, Thank You—AMAZING! My name is Cassandra Hughes. I’ve been on Pinterest for awhile now, I appreciate you and how you’ve guided others through your journey of blogging and boarding. I look forward to viewing more suggestions from you. The name of my Board is Simply Dvine Events and Creations. Glad you are doing great with Pinterest! Thank you for such a nicely laid out, thought out way to up your Pinterest game. I really appreciate the info and ideas. I love your blog! Thanks so much! Glad you found the steps helpful for your Pinterest strategy! I am glad you mentioned about Tailwind because the Tribes feature has really upped my game on Pinterest! This is extremely helpful especially to newbies that are just getting started on their blogs. Really looking forward to applying some of these tips – thanks a bunch! You’re welcome! My Pinterest followers is up to 10k now! This approach is still working! Thanks for the great tips! I’ve been blogging in the Wellness niche (I’m a L.Ac. & yoga instructor) for ~ 9 months now, ramped up from 2x/mo to 1x/week halfway through, and am still having difficulty getting subscribers. I’ve turned to Pinterest to help, but I’m new to it as well. Your growth story is very inspiring. You already had over 600 followers though! That’s a lot compared to my measly 30. Do you think your strategies help from the very beginning? I’m probably still too new to contribute to group pages, though I feel I have valuable content. If you have advice for beginners that is different from what you’ve already mentioned, I’d really appreciate hearing it! Since you’re new, try Facebook groups. Many have social media threads where you can post your social media account you want to grow. You can get like an extra 60+ likes or follows doing this each week! Great post Elna, I’ve been dealing with traffic for my blog for a while without many success. Definitely, I am going to work your tips. Is it ok to pin images representing your blog and the corresponding sales page for the same bunch of pins (w/different images)? Thanks. I am trying to build a Pinterest following currently and these tips definitely seem more useful than many I have found this far! Thank you for sharing! Thanks so much! Pinterest is a great platform to grow your blog! Thank you for the detailed info. Joining Groups makes so much more sense. Great advice! I am a new blogger, http://www.justordinarymom.com, and still learning all the in’s and out’s of getting it started. Needless to say, it has been a challenge. I just posted my FIRST Pinterest post and I am just excited I was able to do it! Now just getting it seen. I already joined Tailwind. I have only been using it for about a day now. LOVE IT! Sounds like you and many others just had to try different approaches and that is what I need to do. Thanks again! That’s awesome! So happy you started a blog and are on Pinterest! Have fun using Tailwind! Thank you for covering board lists! I had never discovered that feature of Tailwind before. You just saved me so much time! Especially since it covered how I can space them out…I was originally worried it would hit all the boards at the same time. Thanks so much for your wonderful comment! I’m humbled by your warm words. As for making money on Pinterest, I think you need to focus on list building via Pinterest first. From there you can start creating pins to landing pages and then upsell once they are on your email list. You can also create pins that direct to Amazon or to your digital product. I hope this helps! I absolutely LOVE Tailwind!! It has helped me extend my reach for my blog. Do you use tailwind to schedule pins for your own website or others pins? I use Tailwind to schedule my pins to group boards. I use Board Booster to loop my pins to my boards. I occasionally schedule other people’s pins on Tailwind by using Tailwind Tribes! For me, it’s more budget friendly when I use Tailwind to pin to my group boards. With Tailwind I pin around 50-100 a day. I only pay $9.99 a month for unlimited pins. With Board Booster, I’d have to pay something like $84/month! So with Board Booster, I only pin 45 pins a day which is only $10/month. It’s just more cost effective for me. It may not be for you. Also, I would change that ratio to more pins of YOUR blog and less of other ones. As for follower growth, I don’t suspect a scheduling tool would help; getting more on group boards yes, making your blog Pinterest friendly and your pins Pin friendly. Hi Elna, this an easy awesome article, I very new to pinterest; I am a small youtuber ( braid, home remedies, makeup reviews) I joined pinterst today because I want to grow my channel. I am lost here lol, everything is new and a bit confusing, I have just posted three videos ( how to do a french braid, how to cornrow and how to do african stretching hairstyle) can you please check my pinterest page and please give me feedback I really need it. Yes I hate follow me I follow you back, that method is big on youtube, I did that when I first started and it’s not good at all. How do you go about getting onto group boards? I’m on a few but was invited. You have to go to the group board you want to be in and look at the requirements. They may ask to email them or follow them. Good luck! Great info! I have been trying to join group boards on Pinterest but no one will invite me even though I follow the directions. I don’t know what I’m doing wrong. Any thoughts? It could be your pin graphics, your profile, your website or your followers. If you look too new, they many not accept you; if your pins aren’t suitable for their audience, they my not invite you. Look at those elements and try to boost those! Good luck! Thanks for the helpful article! I will definitely have to try these! Thank you for this very helpful article. Your clever ideas really are easy! Best wishes for continued success! I am going to implement these principles for my life coaching and pet sitting businesses. You’re welcome and thanks so much! Please update me on your progress in those niches 🙂 I’d like to see if these tips help you out! Thank you so much!I love Pinterest and it’s the perfect social media tool! Awesome! You should see a boost in your traffic when you do that! Good luck! Elna, thank you for your reply. Our original Poster from South Island – New Zealand has been saved/pinned over 2.1k times. But when using Tailwind, we don’t seem to be able to get more Pins to the original poster. Which means, we still have the original at 2.1k, but the same Poster that was scheduled looks like a “new” one only showing 47 pins now. We have downloaded the original Poster directly from Pinterest to Tailwind. So it should be adding the extra pins right? I signed up to Tailwind, so really trying to understand it. Yesterday scheduled up to 100 pins for the next 5 days. So today I am having a look at it, and the pins that were scheduled came up as “new” Pins. But when looking at our board, we have Pins that have been quite successful, that have been pinned 200/300 and one even 2.000 times before using Tailwind. So why when we schedule the Pins through Tailwind it looks like it’s new Pins? Does my question makes any sense? Thanks for sharing this. I’ve been doing exactly what you’re doing here for months and am not seeing much growth. I’m guessing that your Tailwind system must be different from mine then. Do you have a blog post or place where you share in detail how you post to Tailwind? I can share what I use if that helps you compare yours to mine. This is an excellent summary of all the things you need to do to get exponentially more followers in Pinterest! It’s clear and do-able. Thank you. Thank you for commenting. Yes, blogging can be an uphill battle for sure. 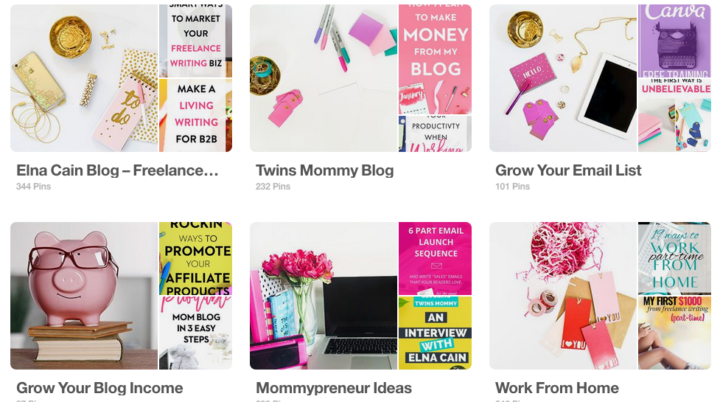 What I find that helps is planning out and having a strategy to do it all 🙂 I think you need to create more pins that direct back to your blog as well as join group boards related to your niche. I also feel you need to guest post to get your blog out there! As for content ideas, I don’t have a post on that yet (but might later), for now look at your competition or look on social to find topics! thank you so much for sharing your knowledge. i am just thinking about getting started with social media and driving viewers to my sites. How do you track which group board you are pinning what to? I’m so worried I’m accidentally going to spam a group or break the rules by mistake, but with writing the blog, promoting it and working full time I don’t seem to have enough time. Set your schedule pins a day based on how many group boards or boards you want to pin to. If you only have 10 boards and three of them are group boards, you can’t set your schedule to 100 pins a day! You might get by with 20 but there will be duplicates. The more boards you have, the more pins your can schedule. It also depends on the group board you belong to. If there are only 10 contributors, your pins may flood their feed. If that’s the case you just have to pop in to your boards and not put those types of boards in your schedule. I belong to over a 100 group boards, but not all of them are in my Tailwind schedule. Many of them only have 5 or 10 contributors, so I don’t pin to them or have stopped pinning to them until they get more contributors. Play around with the amount of pins you schedule. In the beginning, I did get kicked out of some boards, but I just joined more…I now found a good balance between my group boards and Tailwind schedule. In fact, I can even pin more than 100 since I have more than 100 boards to pin to! Hi Elna! Thanks for the great info. I plan on checking out Tailwind today! I have two pinterest accounts and they both have approximately 100,000 followers on each. I am also on several group boards. I generally avoid pinning images that link to my website on them, as I’m not sure if board owners would be bothered by this. I’d love to know your thoughts on this. Thanks so much and that’s great you have a lot of followers! Thanks for all the tips here. I’ve been growing on pinterest, too, but still need to accelerate things. I’ve been finding it challenging to get into more of the top decor boards (I do flooring) as many are closed to new pinners). I’ve also been collaborating with a friend of mine who has a larger following and more group boards, and we are helping each other. Thanks for commenting on this post! That’s great that you are still growing on Pinterest! Good luck! I finally get it. I’ve BEEN trying to find a way to promote my blog post on Pinterest, but never thought about joining groups. I was trying to ring where to follow you ? I see others do it with me but I have never done it before? I have never done anything like this before…thank you so much! Now I get it! I am a middle aged momwho has a chronic illness and I pin (mostly art) to pass the time. Next thing I know I have over 20K pins! If I am going to do this I may as well make a little money right? Sure could use it.. Thank you again. I promise you one thing…when I have many followers I will contact you again. That’s great and I’m sure if you use affiliate link in Pinterest you will make some income! Good luck. Great post, very helpful. I’ve been using Tailwind for a couple weeks now, pinning around 30 pins/day, but pinning mostly other people’s content. I’m in 10-15 group boards. Question for you: How often are you re-pinning the same thing to the same boards? Or once you pin a post to a given board, is that the last time you pin to that board? My blog is relatively new..around 20 posts. So once I’ve scheduled these 20 post pins across all my group boards, I’ve essentially run out of my own content to pin (aside from when I write new posts). How often are you re-pinning the same stuff in the same place? 1. I repin the same content all the time. I have set posts (with content upgrades) that I always schedule. Then I schedule my new pins from new posts, then any alternate graphics that I created for popular posts and then other people’s posts. The ratio is something like 80% me and 20% others. 2. I don’t know how often I’m repinning to the same board, since in Tailwind, I shuffle my schedule and it just pins to whichever board. But, I belong to a ton of group boards (70+) so one pin to one group board probably is pinned once a week or less. You’re welcome so much! So happy you found some great tips to help you grow your Pinterest followers. Thanks so much for letting me know. I hope these tips will help you grow your Pinterest followers! Tailwind is probably the best Pinterest scheduling tool and it takes care of almost all the difficult stuff. Even I have started being active on Pinterest and current have around 800 followers. Let’s see if I can grow it to 2K in three months following the tips you’ve mentioned. Hi! Great post! I’ve only just gotten back to Pinterest after ignoring it (I know, I know) and just started using Tailwind. What do you mean about dripping your posts over the course of a week or month? What exactly is the strategy there, and how do you do it? Also, how do you get 100 recommended optimal times with the free tailwind? They only offered me three optimal times to start. Did you just add to that general time period manually, or am I missing something? Thanks! When I signed up to Tailwind they were offering 100 free pins to schedule. That’s what I mean. When you create you schedule Tailwind learns when your optimal times are and will let you know in your schedule by outlining it in green those times. Dripping just means using their Interval option. When you schedule a pin, at the bottom is their Interval option. I hope that makes sense? I’m doing most of these, and seeing some success already. I’ve only just started that account though (for my travel blog). Fingers crossed it’ll look as good as your Pinterest profile in a few months’ time! Thanks for the encouragement and inspiration! That’s awesome! So glad you are using these tips. Keep me updated on your progress! Thanks for the information and tips. I’ve pinned this:). Looks like it’s time to start using Tailwind. YES! Tailwind rocks and it’s so easy to work. I have no time to stay on social media to promote my blogs. It’s enough that I have to do that for my FB promotes on FB groups. I do really like Pinterest but I have yet to put in the time and effort into making it more active with more followers. I have followed a few of these steps already and I noticed a difference right away with the name changing. Thanks for this post. I will be pinning it for future reference. Tailwind is awesome, thanks for sharing the list of great pics! Hi Elna! Really useful article, like usual 🙂 . I have a few questions though : Do you use Tailwind to re-pin other people’s pins as well? Or just to repin your own? A lot of the group boards have rules about repinning a lot, and of course that is nice to do! But I imagine with over 60 group boards, you have a lot of repinning to do! Also, how do you create the group board list template? I just upgraded for the Pro version of Tailwind and I love it, but I thought you have to manually add each group board to the pins you want to be repinned. Thank so much. Yes, with Tailwind I do repin other people’s content. I also pin my guest posts and blogger friends’ content 🙂 So far, I’m not spamming group boards. Tailwind does a good job at dripping my pins across all my boards. In Tailwind, on the side bar go down to “Board List” I think it’s called. From here you create a new list and just add all the group boards in a similar category. So, if you want to break up blog growth into social media, blog traffic, make money, freelance then you would put the appropriate group boards (and yours too) under those corresponding lists. Pinterest is awesome for bringing traffic back to your blog! Good luck! Awesome post! I’m in desperate need of some Pinterest help. I currently have 616 followers and have been stuck there for months now. It’s horrible. I’ve used Tailwind a handful of times, but nothing super serious. Same with Pinterest groups. I’m in a couple but not many. I think I just need to really hone in on it and find a way to stay focused. Thanks for commenting. Yeah, it all depends on your schedule, your pins and then your content. If these don’t work around each other, it might be hard to grow your followers. Try changing up your pins and increasing your scheduling! Sup interesting and handy tips, I am using boardbooster now, but once I increase my income I think I might make the switch! Yeah, Tailwind rocks! I love it and it’s super easy to use. I only check Pinterest once a day (for fun) but schedule once every two weeks now (since I lowered my schedule from 200 pins a day to 100 pins a day). Wow, this is great! I’ve been trying to get more traffic to my blog, primarily with Pinterest, and I haven’t been having much luck. I’m definitely going to try branding and Tailwind! Thank you for sharing! Thanks so much. So happy you found some inspiration for your blog and traffic. Yes Pinterest is the gateway to get tons of traffic and subscribers. Good luck! great post! Pinterest is where I’m really trying to grow 🙂 I just started on tailwind, it looks like you can really automate that yes? I’ll have to look more into that (I’m on the free trial) worth the $9.99 per month? Hi Elna. I haven’t used Tailwind, but I use Board Booster. Do you have a side by side comparison of those two tools? I’d like to see the pros and cons of each. Board Booster isn’t officially a tool for Pinterest (i.e. Pinterest hasn’t approved BoardBooster for scheduling pins). There is a risk then, of your profile being taken down. But, I haven’t heard anything yet about that. I personally like the dashboard of Tailwind. It’s a drag and drop function and it’s easy to schedule my pins. I found BoardBooster harder to work and I really didn’t like the dashboard. I think it boils down to preference? Amazing tips, as always, Elna! I need to get on the group board boat – stat! I can’t seem to figure out how to find Group Boards on Pinterest. Is there a way to search for them on Pinterest? 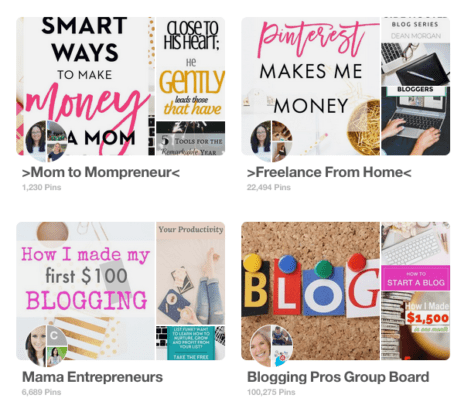 The easiest way I find Pinterest group boards is to go to other profiles in your niche and check out what groups they are in! Click on the group and see the guidelines. 🙂 You can also go on Facebook and catch threads on new Pinterest groups. Or you can ask if any one has a Pinterest group to join. This is awesome. I used up my free trial of Tailwind and switched to Boardbooster, but I do find I am missing Tailwind. I may have to switch back! Good luck with Tailwind. I love it! I love all of your tips and resources! I joined Abby’s group board and scheduled some pins for it. Thank you so much! Awesome girl. Abby is the BEST isn’t she? Love her group board and blogs. Thanks for stopping by. I need to get on the ball with Pinterest. Even though it is one of my top traffic drivers, if I spent time on groups like you suggested it would probably be better. That’s great that you’re going to give Tailwind a try. It really helped me grow my traffic and followers. Of course, you need group board to pin to maximize your Tailwind strategy. Thanks for coming over and leaving a comment! Good luck! Wow Elna, you’ve really gained a lot of followers! I think I might need to join more group boards or something – my followers are growing very slowly. Do you use the interval function to drip out your pins over time to your group boards at all? I was doing this to get my pins to drip out over 1 month, but then I read something on Lady Boss League about dripping them out over a week. So I’m giving that a go. So long as I publish a new post once a week, I’ll have fresh content going out to my group boards consistently. I started using interval because I was hugely paranoid about spamming group boards (it took me ages to even get up the courage to post anything to the first one, lol) and mainly because I thought it would be good to drip the content out over time rather than in one big rush. Initially I thought that I could just keep each pin cycling through my group board list indefinitely, but that doesn’t take into account that as I make more pins, they start to stack and I might overwhelm the boards. Does that make sense? It seemed like a good idea at the time! Yeah it makes sense. Maybe with not a lot of group boards that can be a problem. Since I think I have like 70, my 200 pins weren’t overloading any one group board. I’ve dropped to 100 and when I go to various group boards I can scroll A LOT before I see my pin. Is that a good thing? Not sure yet.. Only time will tell. I have a question about group boards. On the one hand, I’ve heard that unless they’re “good” group boards, don’t bother. This came from someone who grew her Pinterest from 6k to 80k+ in one year, and hit $100k+ income 1st year. But then I see successful peeps such as yourself, who joined tons of boards, and I know some of them have less than 1% virality & engagement scores. So my question is, do you think the virality & engagement scores matter? My Pinterest acct (pinterest.com/HerCountryMusic/) is only growing 10% a month and I really want to light a fire under it! Look forward to hearing your take on the group boards. Thx! That’s a great point. Of course, you can just focus on group boards with a lot of followers, and that’s what I do, but I also belong to smaller group boards. I think any group board is a great group board since you’re growing your reach! Great post! I think I definitely need to re-do my Pinterest bio. The other thing is that I want to join some more groups. This building my followers has been quite challenging but it’s a work in progress that I won’t give up on. Now that I’m starting to find my way on what I want to specialize in I can definitely input some keywords that focus in on a specific niche. I have been using Tailwind for about a month and really like it. Thank you for sharing. It’s a good reference to come back to. That’s great you found some tips to help you optimize your Pinterest profile. Keywords are important as well as having a good presence on the platform! Good luck.